Here’s all the small print in one handy page just so you can be sure you know what’s what. Bookings can be made securely online at www.vegsoccookeryschool.org. Online bookings are processed via Stripe. All bookings must be paid for in full by one of the listed credit or debit cards, by gift voucher or part card and voucher in advance of the course commencing. The only exception is our Professional Chefs Diploma course where companies may opt to be invoiced and pay within 28 days provided the course does not commence before payment is received. We reserve the right to refuse any bookings. Such rare refusals will be notified in writing or by email. No other correspondence will be entered into in such circumstances. All monies paid will be refunded in full unless payment was made using a gift voucher, in which case we will re-credit the original voucher provided the expiry date has not passed. We will not offer a cash refund for vouchers. Bookings can only be accepted from people aged 18 or older. Where a course involves participation by people aged 16/17 years their places must be booked by an appropriate adult. Under 16s are welcome to book on courses designed specifically for children and young people. We reserve the right to cancel any booking which has been taken in error or which would contravene any of our terms and conditions. While we will endeavour to run all scheduled courses we reserve the right to cancel any course at any time. Confirmation of booking does not constitute a guarantee that the course you are booked on will run. Refunds for cancellations are outlined below. You may cancel your booking up to 10 days before your course commences by phoning 0161 925 2000, email or in ‘My Account’ section on the website. After this cut off point we cannot offer a refund or transfer if you cancel your booking. Should we cancel a course under normal circumstances, you will be notified 7 working days before the course commences using the contact details you have given at the time of booking. Normal circumstances include, but are not limited to, courses that we have identified to be impractical to run due to low attendance numbers or that could only be run at a financial loss to the Society. Should we cancel a course under exceptional circumstances, we will notify you as soon as reasonably possible. Exceptional circumstances include, but are not limited to, circumstances which are out of our control such as flooding, gas leaks, power failure, etc. or any factors explained in clause 9 that would make the course unworkable or financially nonviable for the Society to run. We reserve the right to cancel any course at any time in the event that the number of attendees on the course falls below the minimum required to make the course practical to run, where the course would not generate enough income to cover its running costs or where running the course would cause a financial loss to the Society. In the event we are not able to get in contact with you regarding course cancellation it remains your responsibility to ensure you know if the course you are booked on is running or has been cancelled. In the event we cancel a course any money paid to us for the booking by credit or debit card will be refunded back to the original card of payment. If the booking was made using a voucher, we will re-credit the balance of the voucher by the amount used to book the course, provided the expiry date has not passed. If the expiry date has passed re-crediting the original voucher will only be done at our discretion. We will not offer a cash refund for vouchers. In the event of any course cancellation we will not refund any other costs you may have incurred in advance. We recommend all students take out cancellation (and travel, if appropriate) insurance with a local travel agents to cover their costs in the event of bereavement, work commitments or ill-health prevents attendance. We reserve the right to refuse to process any refund or transfer which has been offered or given in error, without due authorization or which would contravene our terms and conditions. Any food allergies or special dietary requirements must be declared at time of booking or as soon as possible before the day of the course. If you only declare an allergy or special dietary requirement on the day of the course and this poses a health risk or cannot be accommodated, your place may be cancelled. In the event of this happening no refund or transfer will be offered. We reserve the right to refuse admission to our school to any student arriving on the day unfit to participate through alcohol, drugs and/or ill health. No refunds or transfers will be offer under these circumstances. 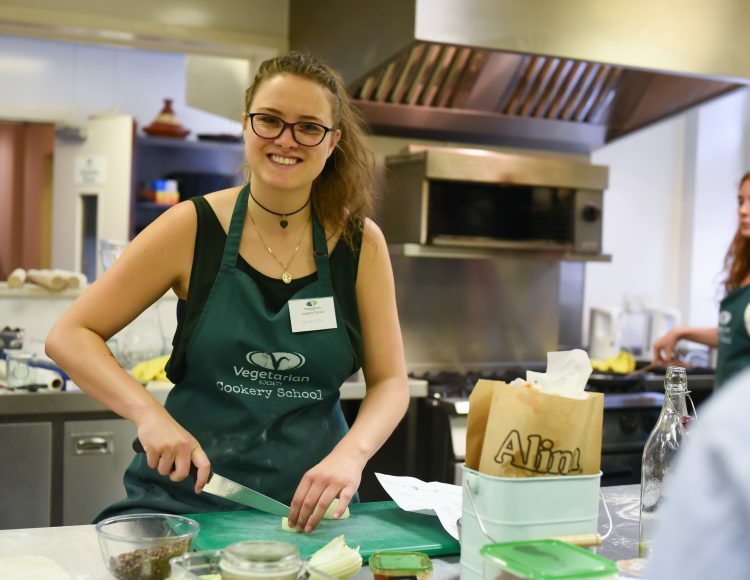 All food cooked during Vegetarian Society Cookery School courses will be suitable for vegetarians. We reserve the right to reasonably alter the schedule of a course or to change a course title without notice. Due to student numbers, allergy or dietary requirements, seasonal availability of ingredients or other factors outside of our control, some recipes mentioned in our course descriptions may not be made on the day. It remains the responsibility of the person booked on a course to ensure that any contact details we have are correct for the purposes of us sending correspondence relating to the booking. It is the responsibility of the person attending to ensure they can get to the course venue on time and/or on the day. No refunds or transfers will be offered for late arrivals or no-shows. We reserve the right to amend these terms and conditions without notice. In the event of dispute, the Vegetarian Society Cookery School’s decision will be final. Booking on a course constitutes acceptance of these terms and conditions. Independent Contractors: If loss, death, personal injury or damaged is caused by the act or omission of any third party unconnected with the provision of the courses neither the Vegetarian Society (the Society) nor its employees or contractors will have any liability to you for such loss, death, injury or damage. If any loss, death, injury or damage arises from any failure to perform or improper performance of all or any part of the courses, neither the Society or its employees or contractors will have any liability to you for such loss, death, injury or damage. If any loss, death, injury or damage arises from any failure to perform or improper performance of all or any part of any course which is due to unusual and unforeseeable circumstances beyond the control of the Society, its employees, or contractors the consequences of which could not have been avoided even if all due care had been exercised or any event which neither the Society its employees or contractors could, even with all due care have foreseen or forestalled neither the Society nor its employees or contractors will have any liability to you for such loss death injury or damage. Indirect or consequential loss: Unless provided elsewhere in these conditions the Society or its employees or contractors will not be liable for any indirect or other consequential loss or damage. In the event that any provision of these conditions shall be held by any Court of competent jurisdiction to be invalid it shall not in any way impair the validity of any of the provisions of these conditions but these conditions shall have effect as if that provision had never been inserted. Vouchers must be redeemed within the validity period which is 18 months starting from the day of purchase. After this the voucher will become invalid and no refund or alternative will be offered. Gift vouchers containing a message that has been worded to imply a course has been booked, paid for or otherwise will not be held valid unless it refers to a booking which has already been accepted and confirmed by the Vegetarian Society Cookery School. Possession of a gift voucher does not imply any actual booking has been made or accepted. Gift vouchers are only redeemable for courses run by the Vegetarian Society Cookery School and no other products or services provided by the Vegetarian Society. In the event we cancel a course which was booked using a voucher, we will re-credit the balance of the voucher by the amount used to book the course, provided the expiry date has not passed. If the expiry date has passed re-crediting the original voucher will only be done at our discretion. We will not offer a cash refund for vouchers in the event of cancellation. Gift vouchers cannot be used for the purchase of other gift vouchers. Multiple gift vouchers may be redeemed in the same transaction, but this service is not available online, please contact us by phone or email. Once a gift voucher is used to book a course, our terms and conditions for course bookings apply. We reserve to right to refuse the use of, and to cancel immediately, any voucher which we believe to have been stolen or acquired dishonestly. In the event we extend the expiry date of a voucher that has expired, we reserve the right to cancel that voucher at any time without offering further extensions or a refund. We reserve the right to amend these terms and conditions without notice. In the event of dispute, the Vegetarian Society Cookery School’s decision will be final. Your purchase or use of gift vouchers constitutes acceptance of these terms.